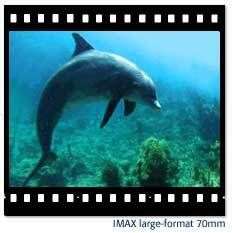 The film used by IMAX® is 10 times larger than the film in a normal 35mm movie. How big is that? Well, imagine a 40 minute film that is nearly three miles long and weighs over 200 pounds. Add to that, the IMAX® film is so strong you could pull a truck with it. What does that give you? A sharper picture, better contrast and higher resolution than anything else on the planet!